Do you dream of the day when your email inbox is empty? Do you wish you could be just a little more productive when it comes to email? Does the sight of your “unread email” counter will you with a cold dread? Well, friends, fear not. Here at SaneBox, we’re on a mission to make managing email faster and more effective. We’ve already talked about better email subject lines and the “two minutes to done” rule. Today we’re going to add another tool to your email-slaying toolset — the science of batching and improving your response time to email. Read on to get the SaneBox Scoop on how this simple technique will make managing email much easier and help you to be more productive. You only read, process, and respond to emails two or three times a day. You focus on responding to similar types of email at the same time. Once you’ve responded to the email, you clear it from your inbox. The most important part of this is getting out of the habit of constantly checking email — it’s a big distraction that really breaks your concentration, makes unreasonable demands on your time, and causes you to be less productive. That means it has to stop. Turn off your email notifications across your various devices and email clients. Even better, close your email client down and only open and use it when you’re going to batch your emails. 9 – 10 AM, 2 – 2:30 PM. 9 – 9:30 AM, 12:30 – 1 PM, 4 – 4:30 PM. The important thing is to choose a time and stick to it. If you’re tempted to break your self-imposed restriction on email, you’ll get back into the “constantly distracted” mindset you’re trying to escape. To make batching email more effective, you want to deal with similar types of email at once. That way you can use your focus and the information you have to respond to multiple emails on similar subjects. Sort by conversation so you can see the conversation threads around a particular subject. Sort by subject line so you can see all of the emails relating to one topic. Sort by person so you can see the type of emails you’re getting from specific people. Sort by urgency, so you know what’s most important. SaneBox does this for you automatically by filtering out unimportant, nonurgent email from your inbox. 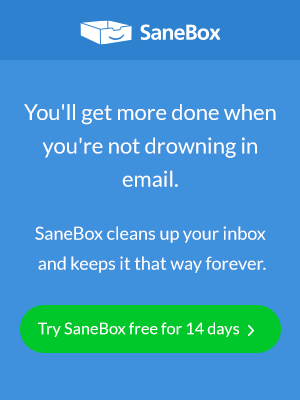 If you haven’t tried SaneBox yet, do it here for free. Search by keyword so you can pull up all the emails about what you need to respond to. Look through your archives and folders if you need to seek out other information from previous emails. Read through all the emails around specific topics so you can get a good overview and idea of the information and actions people need. If people are requesting information, open common files and copy/paste the information they need into responses. You can paste the info into multiple emails from the same file, saving you time. Create some canned responses for information you need to send consistently. See if the answers you need to send someone are in another email in the conversation. Work out if a reply to one email can be copied and pasted into other emails to achieve a similar result. Ultimately, you will work out your own way of batching your email responses. You can tweak and refine how you batch replies to make yourself even faster and more efficient. And there you have it, another simple tool you can use to get more done in less time, just like SaneBox!